Best Buy has confirmed that it will launch a used game trade-in program this summer as part of its effort to become a major player in the videogame retail business. Best Buy revealed earlier this year that it would join Toys R Us and Walmart in trying to crack GameStop's hammerlock on the lucrative pre-owned games market, and while no specific launch date has been announced the company says the program will be rolled out in late summer. The process will be fairly simple, offering gift cards to customers who trade in old games, which can then be spent on anything in the store. The in-store program will compliment the online trade-in program currently available and will offer the same value for used games. Why the big push into games? 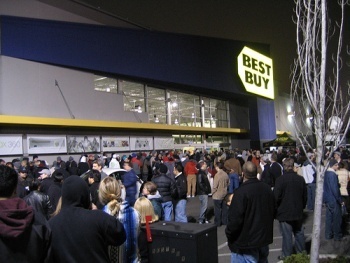 According to TradingMarkets, music, movies and videogames accounted for 20 percent of Best Buy's total sales as recently as 2008 but only add up to 13 percent now. "Music is definitely regressing the fastest," Best Buy CEO Brian Dunn said. "We're starting to see movies move down that line a little bit." What's not regressing, obviously, is videogaming, which the company hopes will help compensate for losses in other areas. It's pushing hard to make an impact, with an in-store gaming magazine, @Gamer, set to debut later this month, and plans to install touch-screen kiosks in stores that will let customers test and pre-order new games. Best Buy also plans to begin offering used games for sale in its stores. "Our commitment to creating an improved gaming experience begins with giving customers easy and exciting ways to connect with the games they love," said Best Buy Senior Vice President Chris Homeister. "We know how important game trade-in is in that mix."